Afghans have cast their vote in the country’s second parliamentary election on September 18th held amid violence and bomb attacks across the country by the Taliban insurgents who sought to disrupt polls. Concerns are growing that votes are marred by intimidation and corruption. Afghan people went to elect lower house of parliament (called Wolesi Jirga in Pashto) and councils in each of the country’s 34 provinces. All the 34 provinces were constituencies and candidates who win most votes in a constituency get the available seat while the same system is for councils. Around 12.5 million people were registered to vote out of a population of 30 million but threats from Taliban to disrupt the votes appeared to have an impact, with about 3.6 millions ballots cast, according to preliminary statistics released by Afghanistan election commission. The UN and other observers had opined before the vote, in the context of Taliban’s threats, a turnout of between five and seven millions would be considered a great success. The poll was already postponed from its original date May 22nd this year by the Independent Election Commission (IEC) due to security concerns, logistic problems and insufficient funds. There were 2577 candidates, including around 400 women contesting for the Wolesi Jirga’s 249 seats according to the IEC while UN-backed watchdog body Elections Complaints Commission (ECC) had removed some 38 names of candidates from 17 provinces over alleged links with illegal arms groups, including Taliban and Al-Qaeda. Many of the contesting candidates were wealthy warlords, former mujahideen factions’ leaders and local tribal powerbrokers. Due to security reasons, around 700 candidates were participating from Kabul as candidates from unsecured and insurgency-torn parts of the country have chosen Kabul as it is safest area to run election campaign. The Taliban had already vowed to disrupt votes. Threatening letters issued by Taliban-declared Islamic Emirates of Afghanistan were circulated widely in Kandahar, Nuristan, Baghlan and Balkh, suggested the people should stay away from the polling centers as they will bomb them. “We urge the people not to participate in the election. Everyone affiliated with the votes is our target — candidates, security forces, campaigners and the voters”, said Taliban spokesman Zabihullah Mujahid. They killed three candidates (in Ghazni, Heart and Khost provinces) and 11 campaigners before the votes to frighten the Afghans forcing them not to go to polling stations. At least 29 people, including 11 civilians, 13 Police officials and five foreign soldiers were killed in Election Day violence, dozen more wounded in 63 gun and rocket attacks, 33 explosions and 30 other insurgent attacks, the Afghan media reported. Two poll workers were killed after being kidnapped in Balkh Province. The New York Times reported that more than 30 rockets hit Kandahar city alone on the election day while Afghan TV Tolo reported five missiles attacked eastern Jalalabad city. The worst single incident emerged in Balkh province where nine civilians died in a roadside bomb explosion. Security threats closed 461 polling stations in addition to the 1000 centers closed by IEC announced prior the votes. Local media reported serious security incidents around 400 polling stations. Polling centers were blown up in Kunar, Khost and Kandahar and captured in Laghman, Kunduz and Baghdis, shutting down the process of voting in those centers. The governor of Kandahar escaped in a bomb attack as he traveled from one polling center to another, seeking to demonstrate it was safe to cast a vote in Kandahar. Dozen of rockets fell on Kandahar city throughout the day and also hit near polling centers in the eastern and northern part of the country. An ISAF spokesman claimed the alliance had provisionally recorded 445 violent incidents aimed at disrupting the election, compared with 479 incidents on the August 20 presidential election last year. Observers said the turnout was very low due to threats from the Taliban but the elections on the whole were safe despite numerous attacks by Taliban to disrupt polls. Basir Ahmed Hotak, an Afghan journalist, said a declining trend in vote turnout can been seen in the four past consecutive polls held in the country — 7.4 million in first presidential elections 2004, 6.4 million in first Wolesi Jirga elections 2005, 4.8 million in second presidential elections 2009 and now 3.6 million in second Wolesi Jirga elections. The results of parliamentary votes will not be released for weeks following complaints of any fraud or irregularities, said Afghan election commission sources. 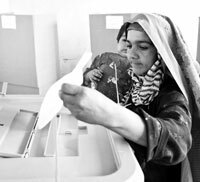 Afghan non-governmental election monitoring bodies and media have reported extensive irregularities in the elections. IEC says delay in the final outcome is because of the logistics involved in getting ballots from remote areas to the regional counting centers, then back to the capital Kabul for verification and this process involves transport ranging from donkeys to helicopters. An official of IEC said the counting of votes has been completed in 32 of the country’s 34 provinces and hoped results of the polls is expected in the end of October. Bashir Rahmani, a journalist form Kabul, said voters in different provinces complained of technical problems which included washable ink, late opening of polling centers and delay in supply of ballot papers. He said widespread abuse by candidates, including vote being traded for $1 to $15 with the average price of $5 each vote. He also said that interference by candidates, candidate agents and other unauthorised persons during the closing procedures was widely reported. The scale of rigging in last year’s presidential elections had embarrassed Karzai and called into question credibility of the country’s electoral process. The Free and Fair Election Foundation (FEFA), an independent watchdog, said in a statement that “violence by candidates, their agents and local powerbrokers was reported in several areas and so were a worrying number of instances of governmental officials in the polling process to sway the results in favour of their chosen candidates”. FEFA deployed about 7,000 people around the country, making it the largest observer of vote while many international observers supported their operation because of security reasons. Maulvi Shahzada Shahid, a former mujahid leader and a candidate from Kunar, said IEC members were paid by wealthy candidates. He said electoral observers were not allowed at the polling station in the province, adding many cases of rigging took place in elections like casting of votes more than one times by voters. Gulhar Jalali, female candidate from Kunar’s district Nadi, complained that 8000 residents of Nadi, including 5000 women didn’t cast their votes because of lack of polling ballots and IEC was not able to send ballots at time. Shokria Barakzai, a former member of Wolesi Jirga and now re-contesting, said rigging this time compared to the elections held in 2005 was way more prevalent. Barakzai said voters are threatened into casting their ballot to a particular candidate, with help of police of IEC officials. Helmand police had found two stuffed boxes abandoned in corn fields in Nowa district. They arrested a man with a list of 12,000 voter registration card numbers with which he intended to record thousands of fake votes, local media revealed. In Uruzgan province’s Gandab area, hundreds of Hazaras seized the main polling stations forcing security and IEC officials to leave and cast about 4200 ballots for their candidate against Pashtun candidates and then left, media reported. News reports of fake voter cards printed in Pakistan and Iran and shipped into Afghanistan for use by candidates were published. More than 100 complaints have already been filed according to the Electoral Complaints Commission (ECC), an Afghan-International joint watchdog body that investigates them. Complaints were frequent from Kabul, Helmand, Nangahar, Paktika, Kunar, Uruzgan, Balkh and Baghlan. The Asian Network for Free Elections (ANFREL), an NGO that works for promotion of democracy in South Asian countries, has also called upon the government to allow an international probe into elections. ANFREL’s head Somsri Hananuntasa, said it was surprising the president of IEC is appointed by the Afghan president himself while the independence of IEC and ECC is marred by several cases of corruption and nepotism. Majority of the candidates contested independently because culture of party elections is not common in Afghanistan. Recently, the Ministry of Justice announced new laws that the 110 registered political parties needed re-registration and for this purpose, a party needs about 10,000 members. Thus, most of the ghost parties with no office and supporters vanished and many could not manage 10,000 members with ID cards to get the registration. Afghan and international officials rushed to describe elections as a “great success”. (The writer is a freelance journalist and social researcher. He works on militancy, development and human rights.